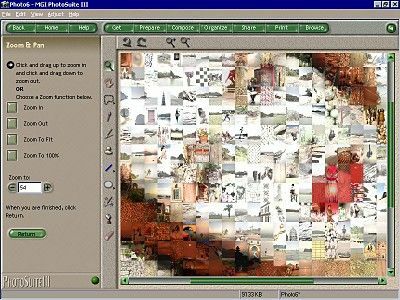 This is according to the ReadMe file (an HTML file displayed after installation), but you really need 100Mb for the program, 185Mb for the Photo Tapestry files and 520Mb for the templates. It also installs several TrueType fonts before the main installation, namely: Adolescense, Banjoman Open Bold, Bermuda Solid, Creepy Regular, Curlz MT, EraserDust, Falstaff Festival MT, Figaro MT, Footlight MT Light, KidTYPEPaint, Mistral AV, Orbus Multiserif, Palace Script MT Semi Bold, Plump MT, Space Toaster, Team MT Bold, Twentieth Century Poster, Wendy Medium. These fonts are used in the content files supplied with MGI PhotoSuite III. The main screen is divided into six areas: Get, Prepare, Compose, Organise, Share and Print. 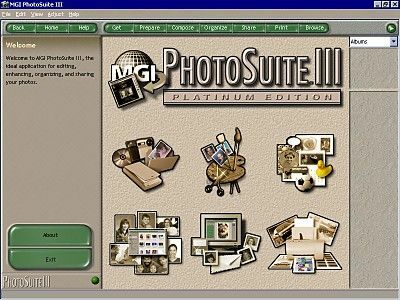 PhotoSuite has plenty of editing tools, from red-eye and scratch removers, cutters that separate objects from their backgrounds, croppers to trim edges, and some painting utensils, such as brushes, erasers, and fills. It can grab pictures from Agfa, Epson, Kodak, Olympus, and Sanyo cameras without going through an intermediate TWAIN driver interface. It is TWAIN compliant, so you can import from other cameras and scanners. Two features, which have been added, are Photo Stitching and Photo Tapestry. Photo Stitching combines several photos into a panorama. It gives you the ability to stitch up to five graphics files (either horizontally or vertically). Photo Tapestry builds chops up your photo into small pieces, then replaces each piece with a close match from hundreds of thumbnails from the CD-ROM (no choice of using your own pictures), and sometimes takes hours to finish its job. The result is an image that looks like a tiled image: up close you can see all the different individual images, and from far away it looks like your original source. 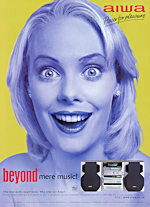 This was used on the poster for the film The Truman Show with Jim Carrey. An interesting effect but not one that you would use often. There are more than 1,200 project templates including signs, business cards, certificates, calendars, photos in a frame, greeting cards and family trees, available from the "Compose" tab. Plus, PhotoSuite supports 18 different file formats, including FlashPix, GIF, PCX, JPEG, TIFF, and BMP. Under "Organize" you can arrange your images into a photo album, adding descriptions or creating slide shows. The album feature lets you manage non-graphic content as well, such as AVI and WAV files. The "Share" tab houses tools for sending a photo, album, project, or slide show via e-mail, including attaching an executable file containing the viewer if you're not sure your recipient can handle graphics files or if you want to send a slide show. MGI provides space on a server so you can host your photos for free. This goes to www.gatherround.com, where you can post an unlimited number of photos, then organise them into online albums and invite your friends and family to view them. PhotoSuite's intelligent Internet tools connects you to Kodak's PhotoNet digital image delivery service and turns any of its projects (or an individual picture) into an HTML page. This means you can put your photos online without any coding, or drag any graphic off a Web page and into PhotoSuite's desktop and edit it to your liking. Unfortunately, the pull down menu system takes a quarter of the screen, leaving less room for looking at the picture you are editing. The zoom function works well, and you can drag on the picture in either direction to zoom in or out. The interface reminds me of Microsoft's Picture It, and the functions are quick when applied to the picture. I was unable to tweak any selection I had made, with a grow or shrink selection, or feather feature. The large selection of templates steers the user to a predefined look, and the program overall doesn't give the level of control that PhotoShop or PaintShop Pro does. It can help you produce stunning pictures, comes with a 42 page full colour manual (which makes a change), the SE Plus edition of VideoWave II, and an offer to get you film developed on a Kodak Picture CD. If you are new to graphic/photo editing on a PC, then PhotoSuite III is a good starting point, but not if you are a more experienced user.